Robert Adamson, 56, is a poet, editor and publisher who has won many of Australia's major literary awards. His wife, Juno Gemes, 55, is a photographer and publisher whose work has been exhibited in Paris, Budapest and London. Together they run Paper Bark Press from their home on the Hawkesbury River, north of Sydney. They have a son, Orlando, aged 25. By the end of the week he had moved in. Bob wanted to get married immediately, but it took me three years to feel it was the right thing to do; I was about to become his third wife and that worried me. We talked almost constantly for that first six months, during which he narrated the entire story of his life. He told me he was a troubled kid at school . . . he felt very at odds with the world, so he just lived according to his intuition and got into a lot of trouble. He spent some years in jail for minor offences. He broke into Taronga Park Zoo one night to liberate some birds. I realised only some months into the relationship that Bob was an alcoholic. I told him he had to choose between the relationship and alcohol. Bob has enormous willpower and he-made the decision to give up grog entirely. He eventually beat it; I really admire him for that. Bob is a person who needs a fair degree of support because his whole focus is his writing and poetry. He doesn't really want to engage with the world very much else apart from that. He'll make it very clear when he doesn't want to be disturbed. He might write all night for weeks on end, then sleep during the day. If things don't go his way he can be very temperamental, but he's mellowing with age. I think he's finally accepting the view that is widely held, that he is a major, some say the major, Australian poet. He's more self-critical than many poets of his generation. While others would be quick to jump into this mantle, he has really taken his time to accept it. Bob always thought he would never travel. That was a big issue for us because I travel very easily. He had a fear that he couldn't get a passport because of his record. He also had a fear that, like Dylan Thomas, he would find himself 'lost among strangers' and take to the drink again. He was invited to go to England last year, as the Australian representative at the Cambridge Conference of Contemporary Poetry. I told him, 'If you want to go, I will do everything I can to back you up.' So he did. It was tremendously reassuring for him, not only that he could travel, but to be among 30 of the world's best poets and to be acknowledged in that company. He's still prone to depression, especially when he's not writing, or if there's some difficulty in his life that he hasn't found a way to discuss. He'll just go into a vortex of depression until I can prise the problem out of him. He becomes very vulnerable at those times. My aunt is the widow of the great Hungarian poet Miklós Radnóti. When we got married [in 1989], I asked her what was the main thing you needed in order to be the wife of a poet, and she said, 'Infinite patience.' She was absolutely right. ROBERT: I met Juno on and off over about three years, during the late '70s. We had the same circle of friends and we'd see each other around the galleries. She was always laying into me about wasting my talent, and saying that I should be more political. I didn't believe politics and poetry mix, so we had this immediate clash, but I loved her straight away. I loved how passionate she was and I loved her intellect, but I was married to someone else at the time. I was always amazed by Juno's work, but initially I was puzzled. I'd always been very sceptical about upper-class, educated women who dabble in Aboriginal politics. I didn't realise for a month or so that Juno was Hungarian, and that when she first came out to Australia as a child she didn't speak any English . . . I think that's the reason she may have identified with minority groups. When I started really looking at her work, I discovered that she'd been documenting the Aboriginal struggle over the past 25 years . . . she'd been everywhere from the urban centres to the most remote outposts in the Northern Territory. Juno can be a tough poetry critic and she'll tell me if she doesn't like a particular poem. Then I have to decide whether it's a bad poem, or whether it's just not politically engaged or what she would consider substantial. Juno can be very possessive and bossy. Her father told me when we got married that the way to get on with Hungarian women is to agree with them, even when you don't agree. Some of my friends are not that impressed with my love of fishing. Juno, on the other hand, understands fishing at a very spiritual level. I think she gained her understanding from living with the Aboriginal people in the Northern Territory. When Juno's in a boat with me and I pull in a huge fish, she doesn't freak out, she accepts it as a part of life's processes. Juno's my muse, in the old-fashioned sense of the word. People don't believe in the concept of the muse any more, but it's still real. The more I think about the muse, the more real it becomes. You end up living with the muse and marrying them. I left Juno for a while recently, because I didn't think she liked me any more. We had a huge reconciliation and now we're a lot stronger than ever before. I realised for the first time that someone actually loved me. I never really thought that could happen; I s'pose I make people prove it. I doubt myself so much that it's pretty hard for someone to convince me that they love me . . . she's the only one that's been able to do it. She's pretty incredible. 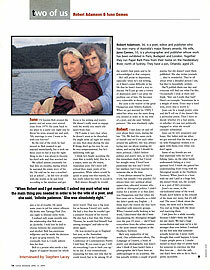 This article reprinted from the Good Weekend magazine, 15 April 2000.